Building social media ecosystems that connect brands with customers through interaction. We often hear: “If you don’t exist in social media, you don’t exist at all”. For most of us, social media is a part of our everyday routine. We daily use at least one of the social platforms either for private purposes or business reasons, or both. Social networks became so integrated into every pore of the society that we can’t imagine our lives without them. And to be able to handle all the new activities new jobs were created – social media manager, community manager, etc. The importance of social media in our lives grew day by day and now these networks are so influential that they are changing the way we do things. They are changing our interactions with other people, how we handling emotional relationships, the way we look for and share the information, the manner we complain or express opinions about products or services, the way we shop and so much more. With the rise of the popularity of social media, the number of different social platforms grew. Their original purpose, to connect friends and facilitate communication, surpass itself. 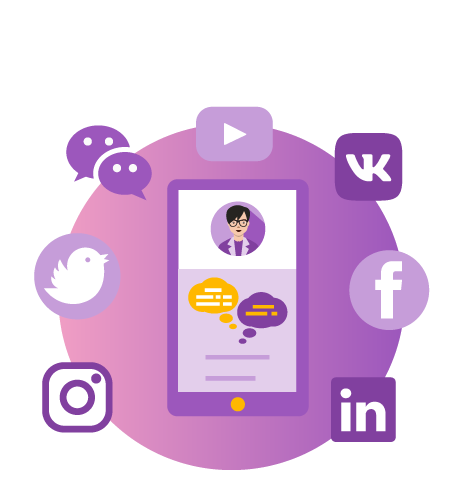 Today’s social networks are used to share and distribute information and all kind of media and files, to collect data, advertise, promote, help users find love, friends, jobs, and so much more. Facebook, YouTube, WhatsApp, Viber, Twitter, Instagram, Pinterest, LinkedIn, Snapchat, WeChat, QQ, QZone, Tumblr, Twoo, Vine, Google+, and so on. We ask ourselves: Do we need so many of them? Is there enough cyberspace for them all? Well, apparently they all found their place under the Internet sun. Each social platform has shaped to be most used for a certain purpose. Namely, we chat and connect with our friends on Facebook, we look for the information on Twitter, we share photos and videos on Instagram, we look for the inspiration, ideas, and recipes on Pinterest, and we look for jobs on LinkedIn. So, most of the popular social networks found their specialization and specific audience and that is why they are (still) successful. The importance of social media in today’s marketing is immense. Social networks are changing, evolving, developing, adapting to the special needs and user requests. It is so difficult to stay on the top of them all, not to mention how back-breaking is to hack them. 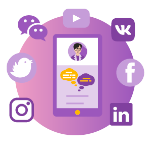 To be able to use a social network for marketing purposes, firstly, you need to use a specific social network for a while as a user to feel its pulse and its audience. Next, you need to understand all the functions and particular purposes of it, as well as the media formats most suitable. The most difficult part is hacking the algorithms behind all functionalities. And of course, at any moment, you are required to know all specific terms and conditions that are updated quite often. So, to use social media for your marketing purposes you need to feel the pulse of it and breathe in the same beat. Not every network is suitable for your brand and mistakes can be easily made and money wasted. It is much better to hire specialists who dedicate their undivided attention and energy to most effective use of what social media has to offer in terms of marketing. Friends, relatives, news publications, celebrities, and brands all compete simultaneously for the social consumer’s attention. In order to rise above the fray, you must determine what value your brand can provide to its audience; what will make them pause, take notice, and react to the content we place in front of them? Answering that difficult question begins with a deep-dive look into how consumers are congregating, communicating, and consuming information in digital, and then using that data to inform activity across your ecosystem. It sounds complex, right? Both, fighting for the attention of users and really knowing the social media tricks and hacks is time-consuming and quite strenuous. That is why social network marketers are so in demand. However, it’s all worth it. All the efforts invested in social media marketing can be rewarded quite generously. The ability to reach consumers at every stage of their buyer’s journey has helped social media become one of the most powerful factors in the purchasing decision process. Consumers get familiar with the brand, product or service through social media, they develop relationships with them through social channels, become customers, consumers, buyers, clients, and they get invested into brands’ stories and afterward their evangelists. Social media has accelerated the speed of sharing information, stories and brand’s culture. Facebook, LinkedIn, Instagram, Twitter and other social networks are offering to your brand a quick information sharing platforms and ability to adapt to almost any environment worldwide. This is so important for success. Brands need to exist globally but act and target locally – exactly what social media is perfect for. We analyze, strategize, implement and measure. And then we do it all over again. You might think you know your customers, however, their needs can be far more elusive. Knowing what exactly a customer wants is more than just a prediction. We implement advanced social networks analytics to understand the behavior, needs, and wishes of the customers. This, in turn, allows us to make better decisions which will generate excellent user experience, engagement, increase brand awareness, and grow sales. We can’t even imagine doing social marketing without the previous analysis. Our key to a successful social media marketing strategy is to know the landscape we are entering. We ensure tangible data for our clients which include research into the social space of their field, defining ups and downs, elaborating on goals and KPIs and competition analysis. Planning social activities without knowledge is a bound-to-fail effort. Together with our clients, we go through the analysis and plan their social profiles management. This is to ensure that together we go in the same direction and to eliminate risks of uncertainties. Defining goals to be reached and letting everyone know what the end result should be. The social strategy without execution is a hallucination. The next step is to implement the plan we constructed. We create perfect templates and visuals for social content, as we understand our clients’ identity. We create content with purpose and post it on regular bases. We boost engagement, traffic, and interactions. We know tricks and hacks of effective social media management. We strive for the best and most effective use of social media. To be excellent social marketing activities must be monitored, optimized and regularly maintained. This is the key to our success. The social landscape can be unpredictable, changes can occur overnight. That is why our devoted team of experts keeps regular check with project progress and implements necessary changes. We chat and connect with our friends on Facebook, we look for the information on Twitter, we share photos and videos on Instagram, and we look for new jobs on LinkedIn. Do you already use these social media for their specific purposes? Die Agentur Novelus ist eine Full-Service-Marketing-Agentur. Unsere Expertise umfasst PR, digitales Marketing und Design. Mit Sitz in Slowenien, Kroatien und Serbien haben wir das Know-how, um Sie auf die Märkte in Südosteuropa optimal zu positionieren.